The mere mention of blood can make some people squirm and uneasy, let alone the thought of eating it. But we thoroughly enjoy all forms of food made with blood and are not squeamish one bit. 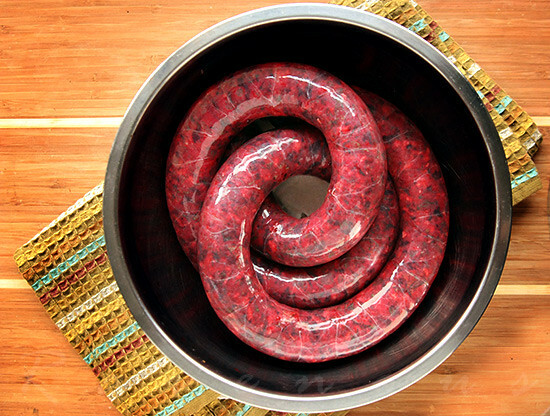 So to celebrate Halloween, we’re making something with blood…and guts: Vietnamese blood sausage (doi huyet)! Blood sausages have been around for thousands of years, and classically made of the fresh uncoagulated blood on the day of slaughter. The French call it boudin noir, Spaniards: morcilla, English: black pudding, Germans: blutwurst, and Koreans: soondae. Whatever it’s called, we love it for the deeply complex and rich taste. With the glamorization of nose-to-tail eating, we hope blood sausages will get’s it’s proper due in the culinary landscape along side pig ears, tongues, and trotters. 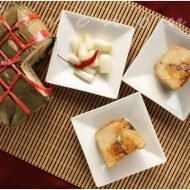 In Vietnam, doi huyet is often eatened as a snack, accompanied by the ubiquitous dipping sauce of fish sauce, lime, and hot chile pepper. It’s also added to chao long, a rice porridge filled with all types of delectable offal. Doi huyet, is marvelous because it’s so simple and relies on two essential filler ingredients and one special flavoring agent. The fillers are fresh ngo om (rice paddy herb) and rau ram (coriander leaves). Ngo om adds tangy citrus and hints cumin flavor while rau ram adds a slightly peppery and spicy note. Filler ingredients from other countries vary widely from barley to rice and even noodles. But aside from the fresh herbs, the game changer here is a dab of shrimp paste. Pungent and aromatic, it works beautifully with the flavor of blood. Mixing all these ingredients together along with the blood will result in an aroma that will leave you craving. The best but hardest to find option is fresh uncoagulated blood. If you’re best friends with a butcher that can supply you fresh blood at a moments notice, then go for it. Otherwise, uncooked coagulated pork blood is readily available at most Asian grocers and will do just fine. Clean and prepared hog casing is also commonly available at your butcher and in Asian grocers. But unlike regular meat sausages which are stuffed, blood sausages are filled. So what’s the difference? You don’t need any special meat grinder or sausage stuffer–all you need is a nice big funnel, gravity, and a chopstick. Drain the hog casing and double tie a knot on one end, set aside. At the same time, heat a large 4-6 qt pot filled half way with water. In large mixing bowl, combine pork blood, ground pork, ngo om, rau ram, pepper and shrimp paste. Using your hands and working quickly, break and combine until well mixed. The mixture does not need to be finely minced–just well incorporated to make sure there are no large chunks of blood. Slide the open end of the hog casing on to the tip of the funnel. Holding both the casing and funnel together, add the pork blood mixture, about 1 cup at a time. Use a chopstick to push the contents down the funnel and gravity will do the rest. Continue until casing is filled and firm. Make sure there are no big air gaps and double tie the end and snip off any unused casing. Making links are optional. To make links, it’s helpful to have a second pair of hands to hold one end stable. Take about 6-8 inch lengths and twist at least three times and repeat for additional links. When the pot of water boils, carefully add the blood sausage. It’s crucial that you do not leave the sausages unattended as the sausage expands during cooking and may burst if left unattended. About 7-8 minutes into the boil, you must decompress the sausage. Using a ladle or soft tongs, lift the links towards the water surface and with a clean toothpick or a new safety pin, pierce each link in several spots. Try to pierce the links just beneath the water surface or the sides of the link because a small amount of blood may squirt out and you don’t want it to squirt on you. Don’t worry, the tiny holes will seal off. Cook for about 25 minutes total. Fill a large bowl with cold water and remove the the blood sausages to the water bath. Let the sausage cool to the touch, drain, and enjoy. No need to re-fry or saute. It’s best to eat this on the same day but will keep well for 2-3 days and can be frozen for up to 1 month. 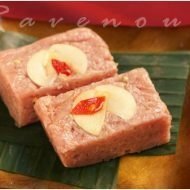 We just love the fragrant fresh herbs intermixed with the complex texture of the coagulated blood as well as the subtle whiffs of shrimp paste. Enjoy in chao long, by itself, or with a simple lime, fish sauce, and chile pepper dipping sauce with bottles of beer all around. Now all this talk of blood and guts didn’t scare you off did it? 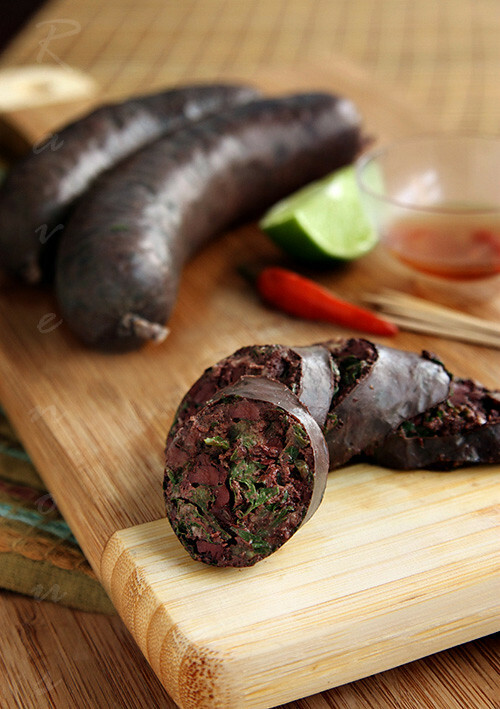 Good, because now that you’ve seen how easy it is make your own Vietnamese blood sausage, don’t be shy, dig in! 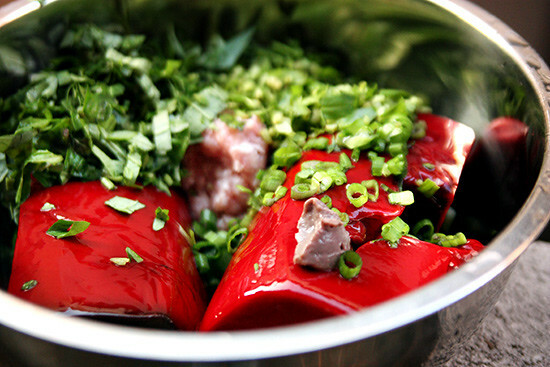 In large mixing bowl, combine pork blood, ground pork, ngo om, rau ram, pepper and shrimp paste. Using your hands and working quickly, break and combine until well mixed. The mixture does not need to be finely minced--just well incorporated to make sure there are no large chunks of blood. Making links are optional. To make links, it's helpful to have a second pair of hands to hold one end stable. Take about 6-8 inch lengths and twist at least three times and repeat for additional links. When the pot of water boils, carefully add the blood sausage. It's crucial that you do not leave the sausages unattended as the sausage expands during cooking and may burst if left unattended. About 7-8 minutes into the boil, you must decompress the sausage. Using a ladle or soft tongs, lift the links towards the water surface and with a clean toothpick or a new safety pin, pierce each link in several spots. Try to pierce the links just beneath the water surface or the sides of the link because a small amount of blood may squirt out and you don't want it to squirt on you. Don't worry, the tiny holes will seal off. Cook for about 25 minutes total. This is our entry to Delicious Vietnam, a monthly blogging event celebrating Vietnamese cuisine created by Anh of A Food Lovers Journey and yours truly! This month’s host is Nina of Miss.Adventures@Home blog. Submissions can be sent to her by Nov 14, 2010 at 7:00 pm pacific time via Miss.Adventure[at]live[dot]com For instructions on how you can participate, visit Delicious Vietnam information page. Great job guys! Not just anyone can make blood look palatable I've only had blood sausage once. It was sliced into my chao long on the mean streets of Saigon (http://gastronomyblog.com/2008/03/19/chao-long/). I was wondering what you guys were going to do with the pork blood. I've never tried blood sausages, unfortunately I've not encountered it on the menu. After reading this post, it doesn't seem all that scary, and in fact the sausages look really good! @cathy: Thanks for the Chao Long link..looks like you should try ours sometimes! The photos are sensational and the recipe intriguing and enticing. I'm a lifelong fan of German-style blood sausage and am eager to try it with these Viet flavors. I want to make some to your recipe exactly as written and then with rice added a la Cajun boudin. If you've already experimented with adding rice I'd be very interested in your opinions of that variation. Many thanks for this tantalizing posting! @jim: we've never used rice with this but don't see why not or why you can't add additional fillers..what makes it different are the Asian herbs and shrimp paste, but also lack of other meats. some, like mom likes to even omit the ground pork. and i dont think i could ever eat that. Wow! I want to eat that! @dolly: you never know until you try..
Eric: Thanks for the correction! Edit made. 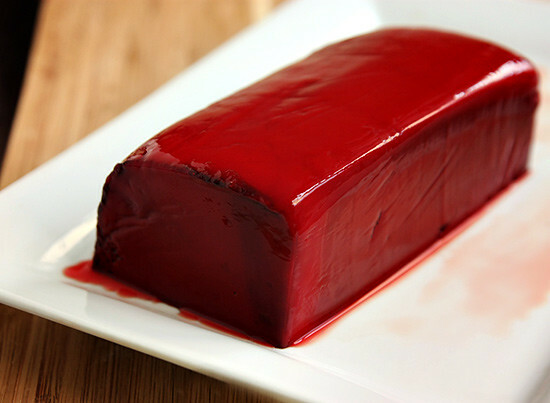 my parents are from the Caribbean and I remember them trying to get me to eat this even before I knew what it was made of because we call it Black Pudding. I just did not like the taste of it. Once I found out years later it was made of blood, made me stay even farther away from it. I love this dish!. We also like to dip in mam ruoc (sauce) seasoned with the traditional garlic, sugar, & chili which makes it extra smelly but oh yummy. Thanks for the tip on using the funnel. Wow, I haven't seen such a huge block of pork blood before! very intriguing. 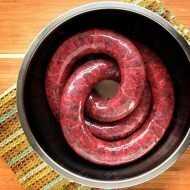 I Love boudin noir, but it never occurred to me until this post that other cultures would have similar takes on blood sausage – duh! Can't wait to give your version a try. My mom uses a baker's bag used for icing cakes to fill the casing. Squeezing the bag is more simple than using a funnel. Thanks for all your great recipes and beautiful photos! We have a black pudding in Guyana and my hats off to you for making this, I was too squeemish to attempt it so I made white pudding. Looks great! you guys rock!! I would NEVER attemot this myself :). It looks soo good!! I love that you made this – my uncle makes a fantastic Vietnamese blood sausage and he's the only one in the family that makes it. I'll have to try it sometime! I tried blood sausage once, it tasted okay, but I just couldn't block out what it was made from. I'm still evolving in my food tastes and experiences i think!! Wow – I learn something new about Vietnamese cuisine everytime I visit your blog. 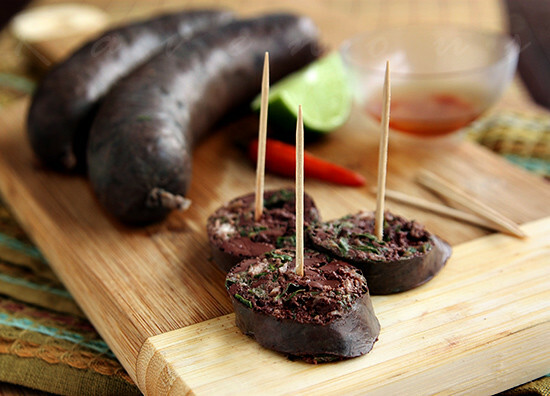 I've had coagulated blood squares in Chinese and Vietnamese cuisine but never Vietnamese blood sausage! Didn't know it existed! The addition of shrimp paste sounds like a genius idea too! Wish I could try some! Nice job! You've photographed them so beautifully. I'm going to have to try this. I've been a little squeamish of eating blood, but have had it once in a Vietnamese restaurant in Dallas,TX. It was good! I'm lucky enough to take this. This was fantastic. I love blood sausages! Where would I find cleaned hog casing? I bought hog casing in Cabela’s and Academy Outdoor stores , $7.99/bag , use for 23lbs. meat . Thank you for recipe but it is seem like missing salt ? No, the mam ruoc or shrimp paste along with the natural saltiness of the pork blood is plenty! you’ll see! Ooh…I can’t wait to try this for my parents! We love em! My mom makes these best blood sausages. Some toasted mung beans is a must in this. Slight ground them. Thank you soo much! I have always know what this and have always love eating it. I just don’t know how to make it. I Youtube it and with no luck. Because of you, I will learn how to do it until I get really good at it and that is when I will YouTube it! Somebody once told me “nep” is also included in this dish. Do you use the stems of the ngo om? yes! let us know how it goes! My mom makes it with alot of different herbs. She also said the mung beans she uses are a throwback to the blood sausages made from dog’s blood. Yes I went there, and wrote the “D-O-G” word. There are regions that still eat dog meat. She calls it “fake dog’s blood sausages” when it’s always made with the mung beans. I’m wondering if you have the South(Nam) version of the chao long sausage…this is the North(Bac) version…. been trying to find that reciepe…can’t find it any where. Thank You in advance. I love pork blood and I always see it fresh and uncoagulated t at ranch 99. But i alway wonder how to coagulate it. Any extra spices to add to it? Crazy that you have this recipe! Reminds me of when my parents used to cook this. Thank you so much for this! we’re impressed you tried it!! glad your dad/friends enjoyed it! 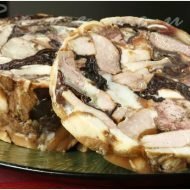 Another term for “offal” is “organ” or “organ meat”, for me is sounds better and more people will understand what it is at first glance, offal is a very old term for organ meats, matter of fact I just made doi huyet this week for my father’s “gio”. My father taught me how to make Vietnamese blood sausages not too long before he passed away, he added the ears, tongues and uterus, he did not used the shrimp paste though, after boiling the sausages, I grilled them on the grill, oh…delicious! ah…he also used a different kind of casting, more thicker, its does not got splits when cook and grill. Those sausages looks so delicous and cute! My kids would love these and so would my husband and I.
I would do a couple of things differently in the recipe itself. First, if one really wants to go all out and original, I would use chitlins instead of the hog casing. Just make sure to clean them well (turned inside out) and remove the excess fat tissues along the wall. 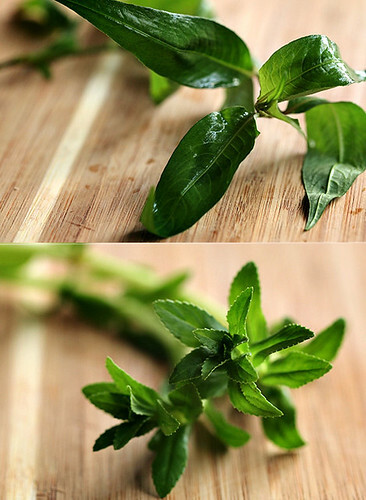 Second, I would add an equal amount of basil (rau hung que an pho) as you would with the rau ram. And last, to enjoy these slices of heaven to the fullest, one has to have a sauce to dip them in! Sauce is consisted of shrimp paste, lime juice, and sugar. Start out with equal parts of the three and vary from there to your taste. Don’t forget to spice it up with fresh hot pepper.